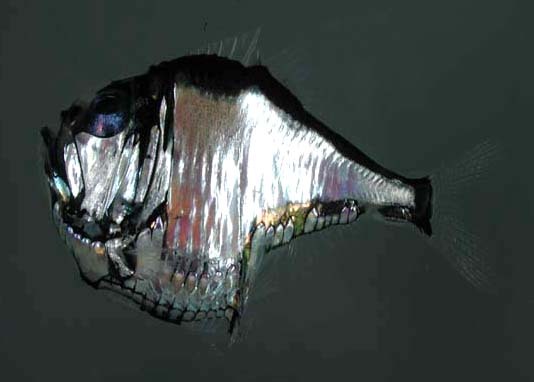 These ghostly creatures are Marine Hatchetfish. There are about 40 species ranging between 3 and 12 centimetres in length and they obviously get their name from their hatchet shape when seen in profile. You probably won't have these guys in your aquarium at home, although you might have the unrelated Freshwater Hatchetfish instead. 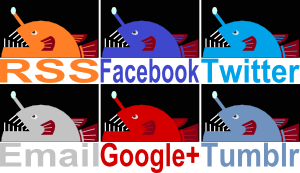 The Marine variety can be found in all the major oceans in the warmth of tropical and subtropical waters. 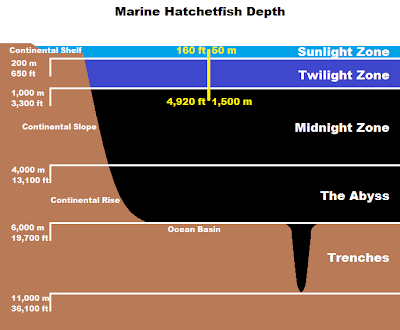 Kind of warm, anyway; the deep sea isn't all that conducive to the balmy or the clement. They don't seem to like it much do they? In fact, they appear decidedly agonised. It's not so bad though, it's all to do with how they make their living. 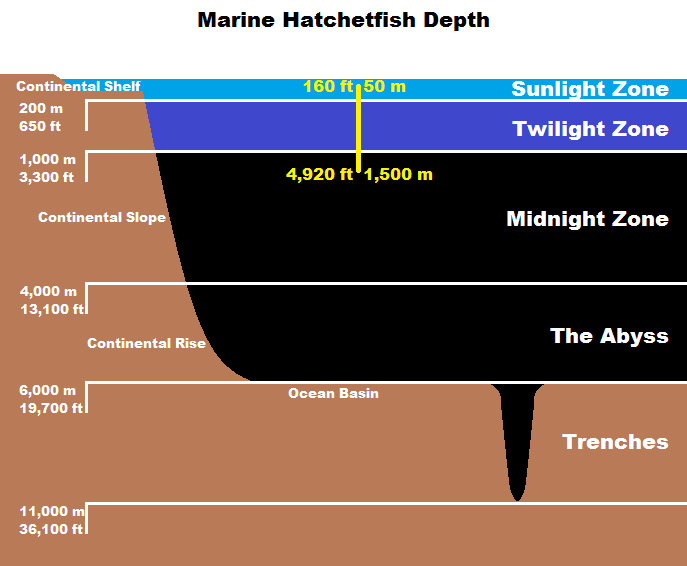 For starters, they usually remain in the twilight zone, several hundred metres beneath the water's surface. Here, there is enough light for a good set of eyes to be useful. They therefore have a good set of eyes. They even point upwards to some extent so that they can look skyward and soak up as much light as possible. Prey such as small crustaceans and fish can be spotted by the shadow they cast. 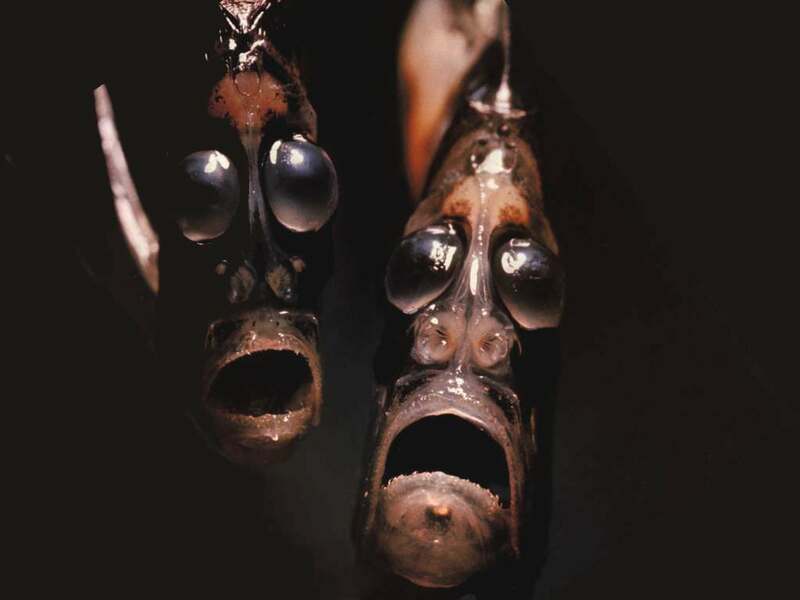 These eyes are also tubular so it's all quite similar to our very own Pacific Barreleye Fish, they just haven't taken it to quite such a ridiculous extent. 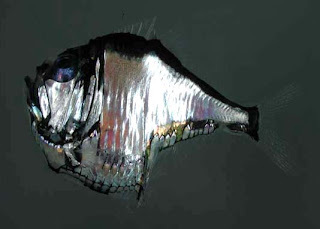 One clear problem is that if the Marine Hatchetfish can use silhouettes to find prey, predators may well be able to use silhouettes to spot Marine Hatchetfish. Becoming incredibly thin probably helps mitigate this issue, but these little beasts have another trick that makes them all the more ghostly. Their underside is covered in bioluminescent photophores that can emit a blue light of just the right intensity such that the fish disappears into the surrounding twilight. With this cloaking device they remain safe and sound, right above their enemy's nose. They're not called Marines for nothing! The first picture looks like a still photo advertising the latest horror movie. I agree with both of you. It's certainly not a face I'd want to see peeking out of the darkness. Or anywhere else, for that matter.